Shiningford, Hollywood House and Standlow, gives you the opportunity to design your perfect wedding weekend. Be inspired and realise your dream wedding! 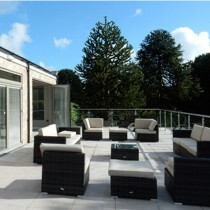 Ashbourne Self Catering specialise in hiring luxury wedding venues in spectacular locations in Derbyshire. You can make your special event a weekend to remember, and not just a day. All our venues are luxury self-catering properties in Derbyshire, that give you the freedom to design and plan your own wedding day. You can choose your own caterers, and we don't even charge for corkage! Pick whatever caterers, entertainment and decorations reflect your wedding theme. The spacious grounds allow you to choose between a Marquee, Tipi or Yurt, based on your preference. We are still on hand to help with supplier recommendations, and will even provide a wedding coordinator to ensure that your day runs smoothly. Standlow and Shiningford create a perfect backdrop for the bride & groom to create their special wedding weekend. 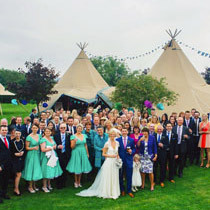 Both are luxury self-catering wedding venues with plenty of space for a marquee or tipi. Shiningford sleeps 34, and Standlow can sleep up to 52 guests. If your guest list is more intimate, indulge in Hollywood House and soak up the glitz and glamour! Hollywood House sleeps 40, but can dine up to 90 at the wedding breakfast. I cant believe that it is 2 weeks since we were in Derbyshire! I would like to thank you for Standlow! 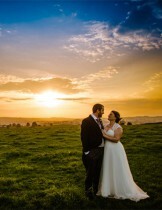 We had the most wonderful time – the time in Daisy Cottage was perfect for all that had to be done for Bill & Lizzie’s wedding, and as for High View Grange Farmhouse – well that was truly amazing. Family & friends arrived safely and the oohs and aahs rang around everywhere, from the brilliantly equipped games room, the beautifully decorated & appointed accommodation, the view – in fact everything was perfect. We are reasonably acquainted with self catering accommodation both in the U.K and abroad but nowhere comes near to Standlow – I am aware that the occasion was particularly happy but its wonderful success was in small part due to the quality and warmth of your wonderful venue. Standlow - "The Place To Stay and Celebrate"
Hollywood House - "Memories That Last a Lifetime"
Shiningford - "A Fairy Tale Venue"
Freedom to to create your own personal weekend, with no corkage charge! “After a call to yourselves we were introduced to Shiningford. 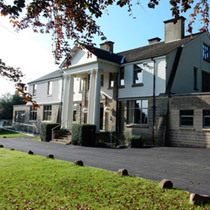 Still in its infancy as a wedding venue you accommodated our visit at very short notice. Believing the creative and imaginative plans you wanted to make we took a gamble …..
Low and behold everything (and more) you stated would happen DID! Because of that we had an incredible stay at Shiningford. Words cannot describe how much of an amazing place this is. From greeting our weekend guests in the courtyard, enjoying a BBQ on the Friday night, a fresh morning swim followed by a warm jacuzzi. A full day of celebrating Saturday through to sober Sunday with the fires blazing and a chance to really soak in the warmth the house provides – This really was a dream house, not just for ourselves but everyone staying with us. Wanting to travel in style? Whether you require a vintage car, limousine or 1950s double decker bus, follow the links to find the right mode of transport. Jen & Andy's wedding Standlow - Love the cake!